The Olive Exclusive is a wonderful boutique hotel comprising of just 7 suites. The location is perfect, overlooking an olive grove with a backdrop of mountains, in a quiet suburb, just 10 minutes from Windhoek city centre. The moment you enter the building you will encouter a feeling of tranquility and a warm welcome by the staff. The warm tones of the decor and furnishings and the artefacts that adorn every surface invite you to sit and relax. There is a reception, bar, lounge, small gift shop and The Olive Restuarant where you can enjoy excellent meals. From the restuarant you can wander out onto the large deck and look out onto the gardens and cobbled walkways, a pleasant venue for outdoor dining. It is also here that you will find the swimming pool. A great deal of thought has gone into the decor and the owners have found the perfect blend of contemporary, cool, style and individuality. 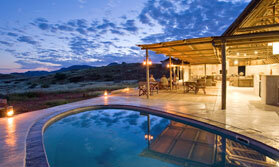 There are 4 premier and 3 junior suites, each designed to reflect a different region of Namibia. The simple elegance is reflected in the abstract Namibian landscapes that adorn the walls, through to the natural furnishings and artifacts that are incorporated into the rooms. The end result is warm and welcoming and authentically African. The facilities in the suites are predominantly the same, with satellite TV, air conditioning, gas fireplace, complimentary WiFi, laptop with internet, telephone, minibar and Nespresso coffee machine. All of the suites have a lounge and dining area and staff will happily arrange a private dinner on request. The beds are super-king-size or twin beds, and each en-suite bathroom has a spacious walk-in shower. Double basins, a free-standing bath, candles, eco-friendly body products, fluffy towels and bathrobes and under-floor heating finish off the suite to perfection. The main difference between the suites is the size and the view. Premier suites have a private plunge pool and Junior suites have a small private courtyard. Whichever you choose, you are sure to feel at home during your stay, and you will be well looked after. Open: The Olive Exclusive is open all year. Location: In the quiet suburb of Klein Windhoek, just 10 minutes from Windhoek city centre. Rooms: There are 7 suites all with satellite TV, air conditioning, gas fireplace, complimentary WiFi, laptop with internet, telephone, minibar and Nespresso coffee machine. All of the suites have a lounge and dining area The beds are super-king-size or twin beds, and each en-suite bathroom has a spacious walk-in shower, double basins, free-standing bath, candles, eco-friendly products, fluffy towels and bathrobes and under-floor heating. Premier suites have a private lunge pool and junior suites a private courtyard. Activities: Being close to the city centre you are free to explore Windhoek at your leisure. If you wish, you can pre-book spa treatments at the Olive Grove Guesthouse which is next door. Facilities: Olive Exclusive has a lounge, bar and restaurant and small gift shop. You can choose to dine indoors or outdoors on the expansive deck. There is a swimming pool and seating area in the garden. The hotel offers a laundry service. Dining: Meals are served at individual tables, indoors or outdoors as you prefer. Private dining in your own suite can be arranged. Health: This is a very low risk malaria area. Communication: There is free Wi-Fi and main line interent in all the suites. Notes: The hotel accepts visa and mastercard and cash in Namibian dollars or South African Rand.